The Valtek Valdisk™ is a heavy-duty, double offset butterfly valve used whenever high capacity is needed with the lowest possible pressure loss. Available in pressure classes 150-2500 in carbon steel and stainless steel as standard materials with a wide variety of alloys as options. 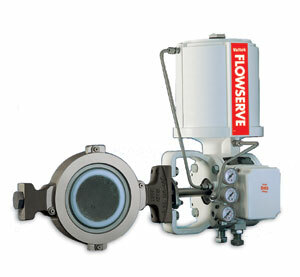 The high-performance Valtek Valdisk™ Rotary Control Valve uses pressure assisted Jam-lever Toggle™ seating concepts. These concepts achieve bi-directional, bubble-tight shutoff while maintaining low breakout torque at both high and low pressure drops. Valdisk™ is available in carbon steel, 316 stainless steel and other alloys. It is also available in ANSI Classes 150 through 2500 in sizes 2″ though 30″. Jam-lever Toggle™ seating assures low breakout torque by utilizing the pressure drop across the valve to aid the seating process. Since the pressure drop supplies much of the seating force, the need for strong actuator seating force, and therefore breakout torque, is reduced. Combined with Valdisk’s™ high-thrust cylinder actuator and eccentric-cammed disc, it is possible to achieve especially high performance throttling, even in large pressure drops close to the seat. A double offset has been designed into the disc to lift it out of the seat immediately upon actuation. This avoids wear on the seat and disc, while reducing leakage and parts replacement. The elimination of friction also improves throttling.